I don't if this is adrenalin rush or show off but a Ghanaian pastor, who is the head of the International Godsway Church, Pastor Daniel Obinim whom the wife once claimed to be an angel with foresight and is known to perform miracles has done it again. The Ghanaian man of God was said to have encouraged his church member to play lotto game. Th lucky man with faith played the game and surprisingly won himself 3 billion Cedis which is N230,325,075,600 when converted to Nigerian currency. 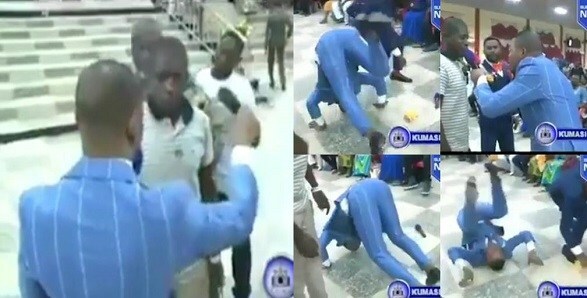 The elated clergyman could not believe his ears and eyes when the lucky man came to give testimony in church that he somersaulted thrice. Aother man was seen joining him in the exercise.